Sasthipada Chattopadhyay is a star in the world of children literature, he is also famous for writing mysteries and intelligence story. The detective story 'Pandav Goenda series' is a best creation of this author and this series gives him the greatest popularity. Besides he wrote many mysterious romance, horror, travelogue stories as private detective Ambar Chatterjee, Tataner Avijan etc. His notable works are- Choturtha Tadanta, Kakahigar Avijan, Sera Rahasya Panchish, Rahasya Rajanigandhar, Debdasi Tirtha, Kingbadanti Bikramaditya, Kedarnath etc. 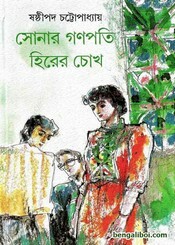 Now I want to share a pdf file of 'Sonar Ganopati Hirer Chokh', it is an another popular book of his writing. The ebook pdf has 213 pages, 8mb file size.